I’ve been living in New York for four years now, and in all that time my parents have never visited me once. So when they finally decided it was time to drop by, I thought I should treat them to a nice meal (or two). On a side note though, they were actually in New York for a wedding, so I was really just free housing for the week. Oh well, you take what you can, right? One of my all-time favorite restaurants in all of New York is Jean Georges. This is definitely a restaurant for special occasions with its high ceilings, white tablecloths, and extra large windows reaching all the way up to the ceiling surrounding a pristine main dining room. Each table is spaced well away from every other table in the room so it is never too noisy or crowded, giving diners a sense that the restaurant is serving them, and only them. Service is exceptional to the point where all dishes at the table are placed down simultaneously then explained in great detail. Water glasses are never empty and any questions or concerns are addressed immediately. Not only is the food delicious and presented beautifully, but they also offer an extremely affordable lunch for a three Michelin-stars rating. 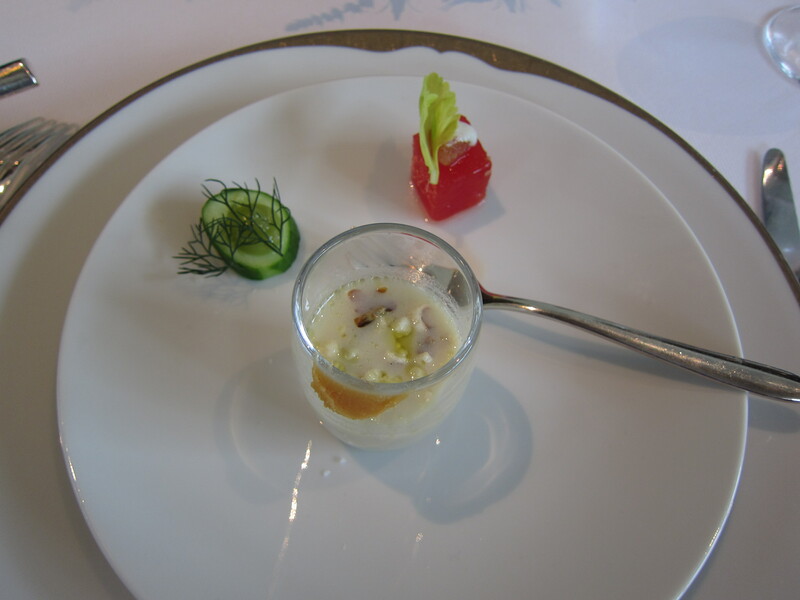 Our amuse bouche to start was a spicy seasoned piece of watermelon, a slice of crispy cucumber, and a shot glass of miso soup with popcorn bits. The watermelon had a good kick of spiciness and while the soup was creative in theory and texture, most people probably wouldn’t care much for it. My first course was lightly poached Maine ruby shrimp with serrano chillies and topped with sea urchin. The presentation of this dish alone was visually stunning. 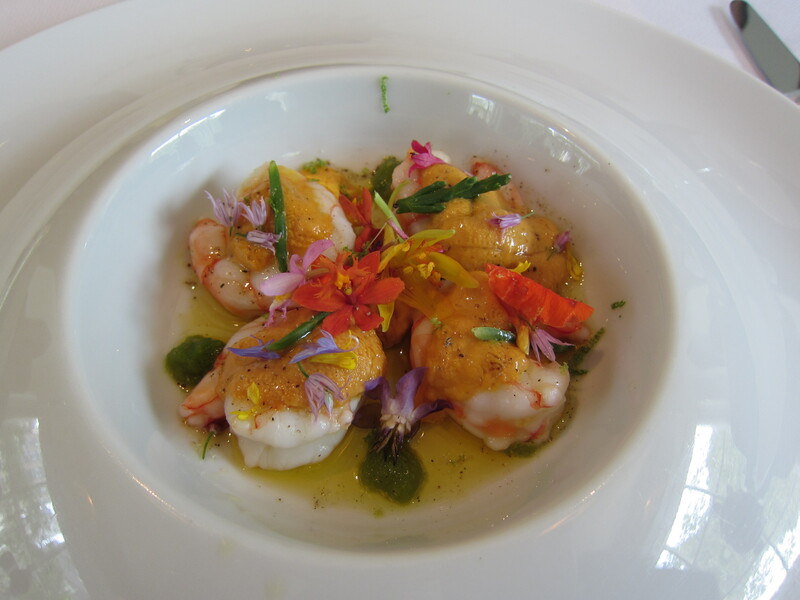 Small orange and purple flowers were sprinkled over the perfectly cooked shrimp, almost like colors jumping off an artist’s canvas. The uni added a smooth, buttery richness to the dish that was balanced by a hint of citrus from some lime. My mother started off with a delicious peekytoe crab salad. The large chunks of crab meat were mixed with a nice amount of spice and topped with a sweet scoop of iced honeydew sorbet. The chilled sweet and spicy flavors blended nicely into a great summer time dish. 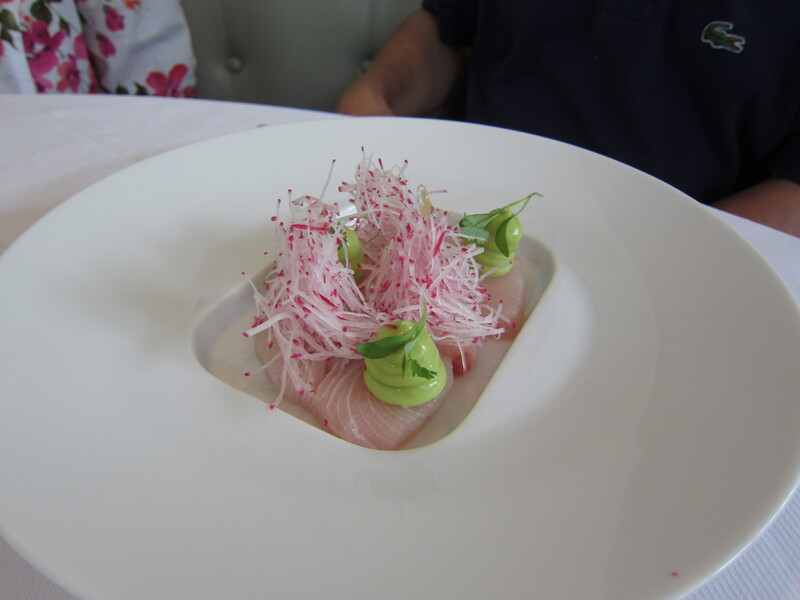 The hamachi sashimi with avocado, yuzu, and radish for my father. 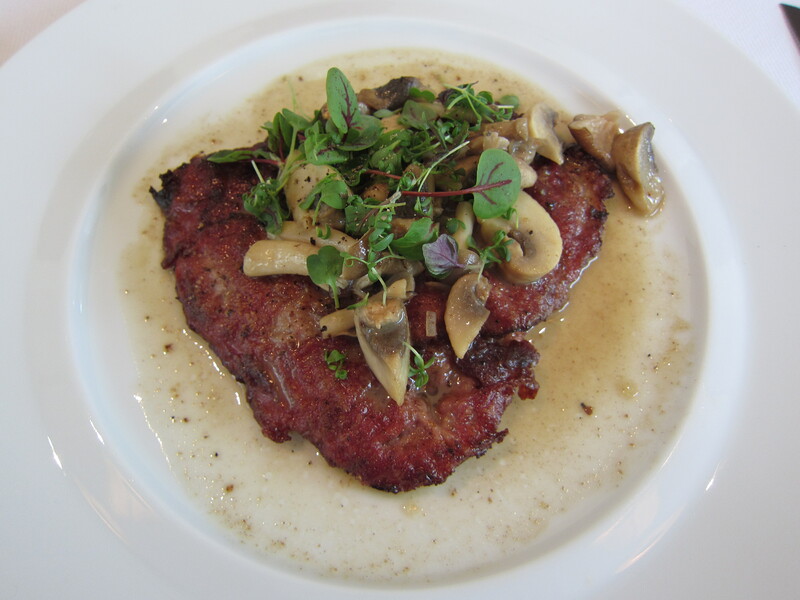 My second course was a sauteed veal scallopine with flying pig ham, mushrooms, and lavender. The mostly tender veal tasted peppery and the ham had a great crisp to it. The mushrooms added some earthiness to the dish, but there was not much lavender taste to it. 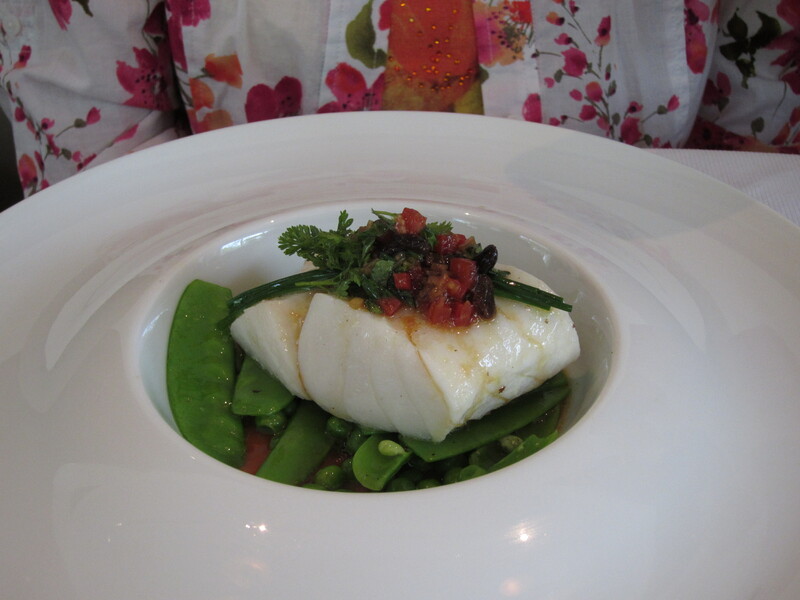 To follow my mother’s crab salad, she had a nice and flaky steamed piece of cod with good flavors in a miso garnish, all atop fresh and crispy snow peas. Jean Georges never ceases to impress me no matter how many times I go. Everything from the beginning of the meal to the end is on a level above everywhere else. It even earns the approval of parents it’s so good! 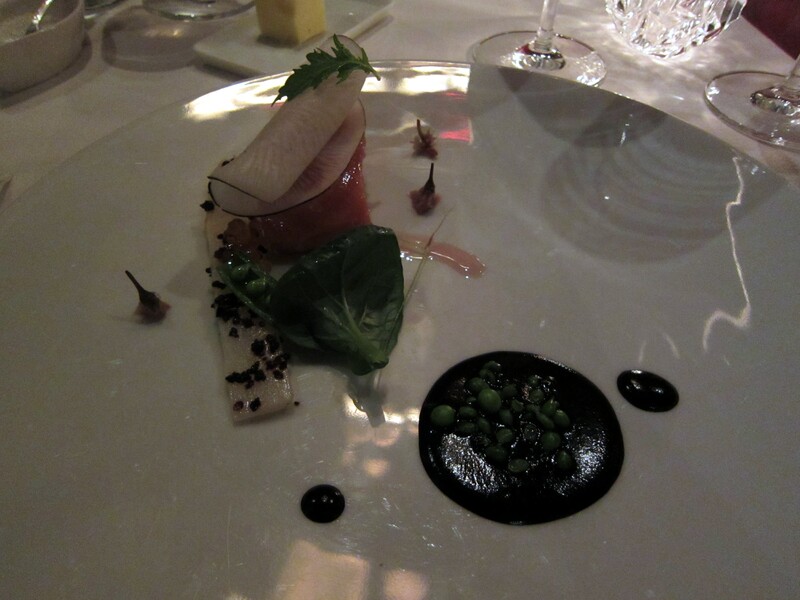 If ever in New York, makes sure to dine at Jean Georges. You will not forgive yourself if you don’t. Note: Not pictured were petite fours consisting of cassis macarons, house made marshmallows, and chocolates. Walking into Gilt’s dining room, I could not help but stand back and admire the room. A relatively smaller dining room with dim lighting gives diners a feeling of intimacy. However, high ceilings and elegant decor make it seem almost extravagant. Gilt offers both an la carte menu and tastings. On this particular night, we opted for the regular five course tasting. Service was excellent throughout the meal. Our waiter was very attentive to all our needs, but still kept his distance and did not give us a feeling of being nosy or unwanted. The bread selection was nice, but our favorite was an atypical chewy pretzel bread. 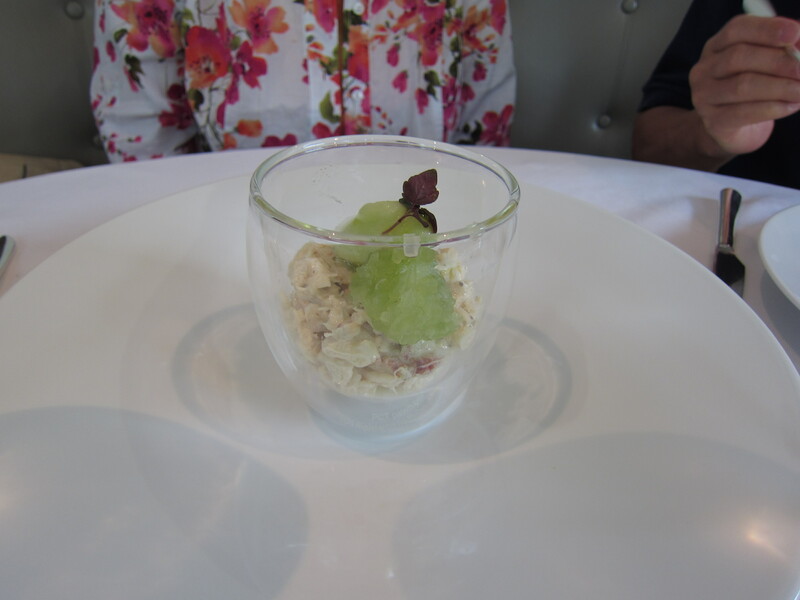 To start off our meal, we had an amuse bouche of elderflower and cucumber juice. It was a bit fizzy with a dash of salt that emphasized the taste of the cucumber even more. 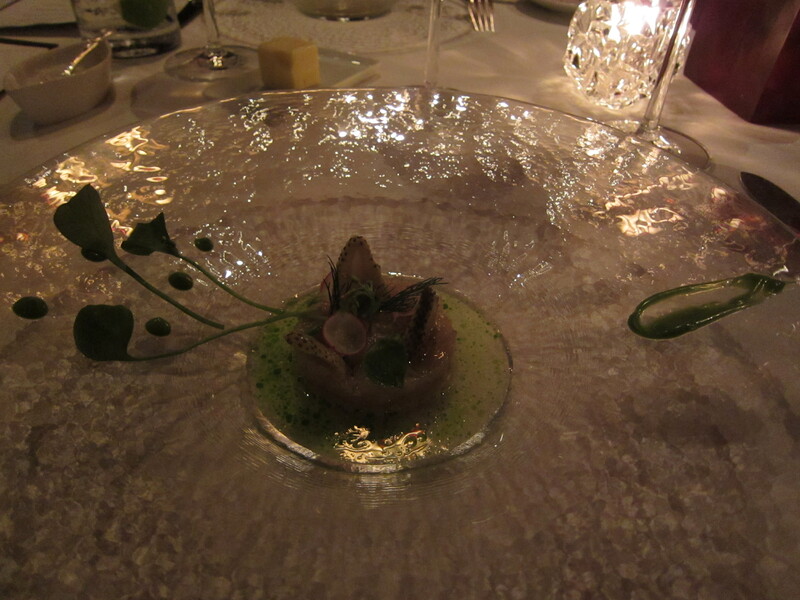 Our first course was a lubina fish tartare from Veta La Palma with green strawberries, miner’s lettuce, and fennel juice. The tartare was really tasty, both in texture and flavor. 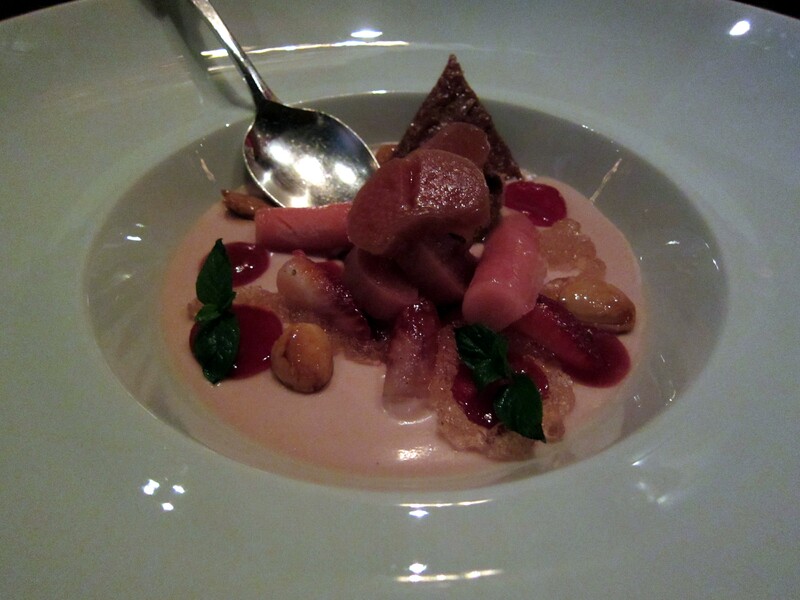 It added a salty taste to the dish while complementing the semi-sweet and refreshing strawberries. 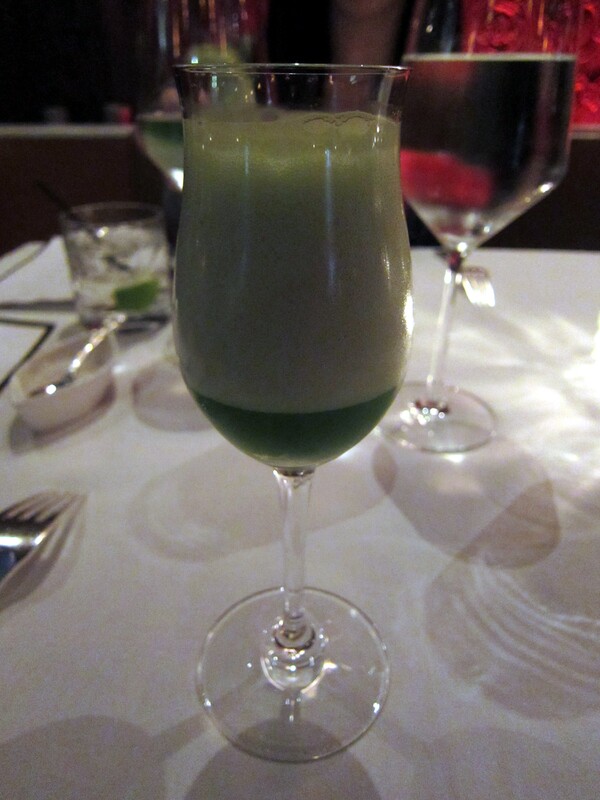 The fennel juice added a good earthy balance of flavor to an overall good dish to start off our meal. 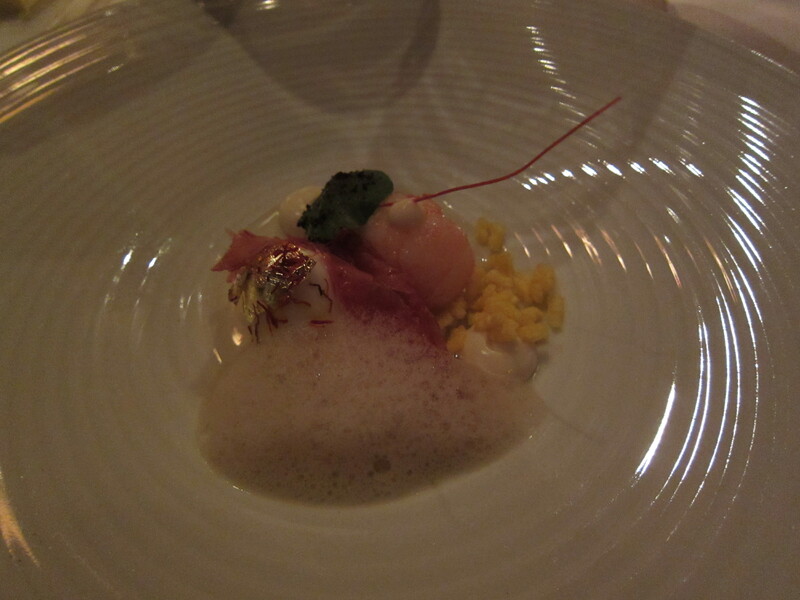 The second course was Scottish langoustines with Ibèrico ham, saffron, and cauliflower crème. The langoustines were somewhat over salted and took away from the other components of the dish. Besides that, the quail egg was cooked nicely. Next, we had wild Alaskan king salmon with cherry blossom, white asparagus, black olive, and salmon roe for our third course. The seared salmon was good, but not memorable. The white asparagus added a nice bit of texture to go with the fish while the black olive sauce was a bit overpowering. Niman Ranch beef was our fourth course, alongside charred cucumber, heirloom carrot, and peanut. The ribeye steak was cooked a beautiful medium rare with a nice char on the outside. The picked cucumber also had a nice char on it which provided a smokey taste to the dish that went well with the sweet carrots. Unfortunately, the steamed bun on the side didn’t quite fit as it had a totally different flavor profile. 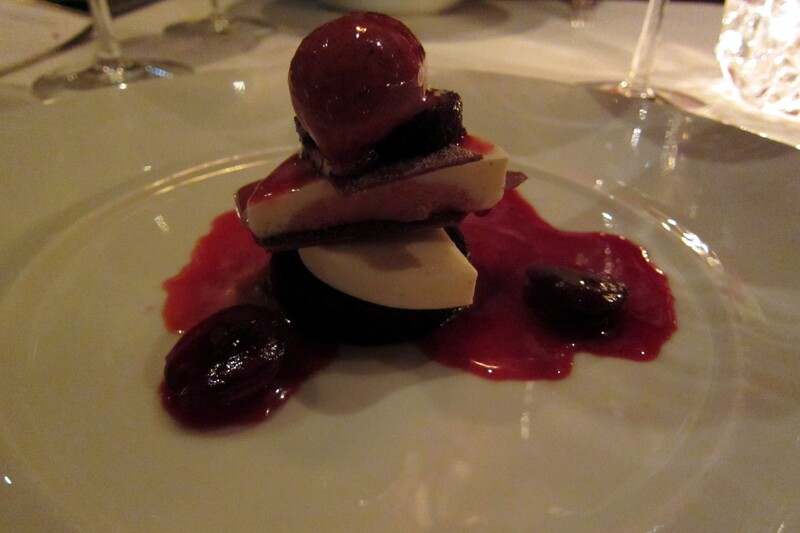 For my fifth course, I had steamed chocolate cake and black forest Bavarian. Good tart flavor from the cherries paired nicely with the creamy dark chocolate. My friend had a delicious strawberry rhubarb with lots of flavor and different textures. It was not overly sweet and was the perfect end to our meal. 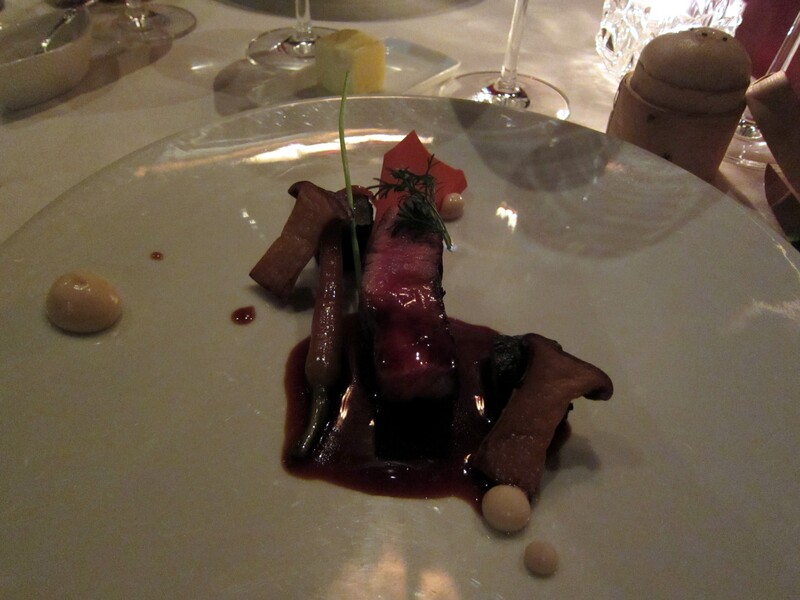 I can see why Gilt holds two Michelin stars against its name. Exception service, well thought out and delicious food, all with beautiful presentation make this a special restaurant. It’s not everyday that you get to dine at a two Michelin-starred restaurant; and even with my expectations, I was not disappointed. For the couple days I was in Portland, there was only time for a few meals, so I made sure to make them all count. I was impressed by the cooking of chef Naomi Pomeroy after watching Top Chef Masters. I was even more excited to have the opportunity to visit Portland and dine at her restaurant. 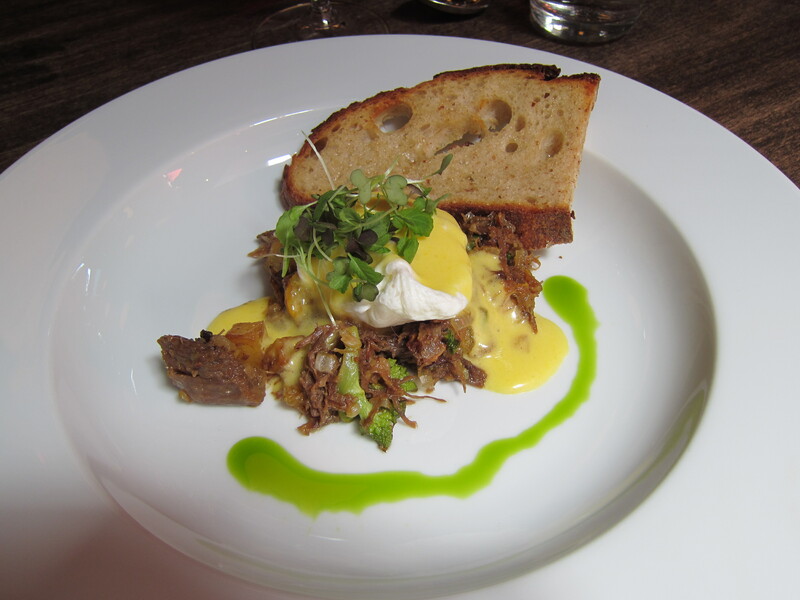 Brunches at Beast seem almost like exclusive events, having only 2 seatings each Sunday at 10am and 12pm. Doors open exactly at the time of seating, as patrons are allowed to enter and sit at long community-style tables. Reservations are a must. The cozy restaurant is small and quaint, with an open kitchen on one side and the plating table right in the middle. It’s nice to see the chefs working to prepare all the ingredients and plate all the dishes just a few feet away. Seeing everything come together from scratch gives the diners a feeling of comfort that the food is fresh and cooked with care. 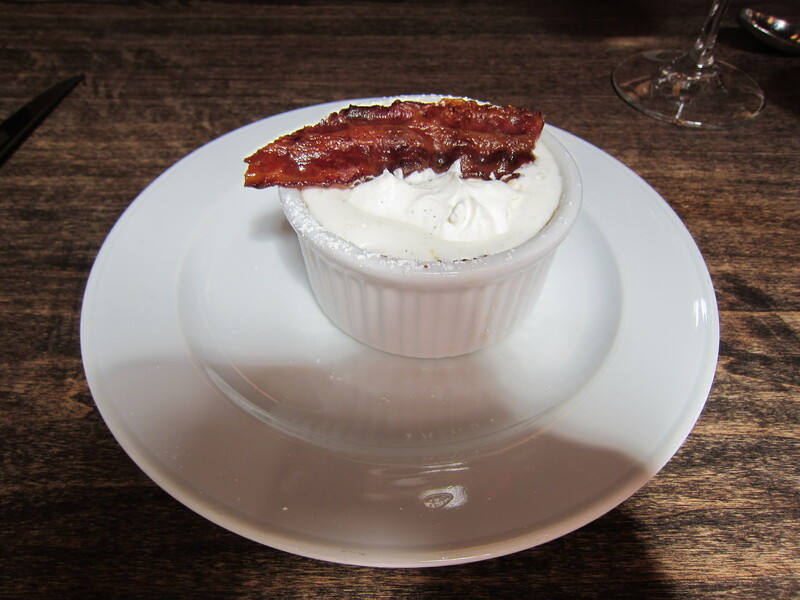 We started brunch off with a light bing cherry clafoutis topped with a smokey and crispy thin slice of maple-glazed bacon and some powdered sugar. The pastry was soft, creamy, and had an almost flan-like texture. Fresh pitted cherries added a rich dark fruit flavor and some sweetness. 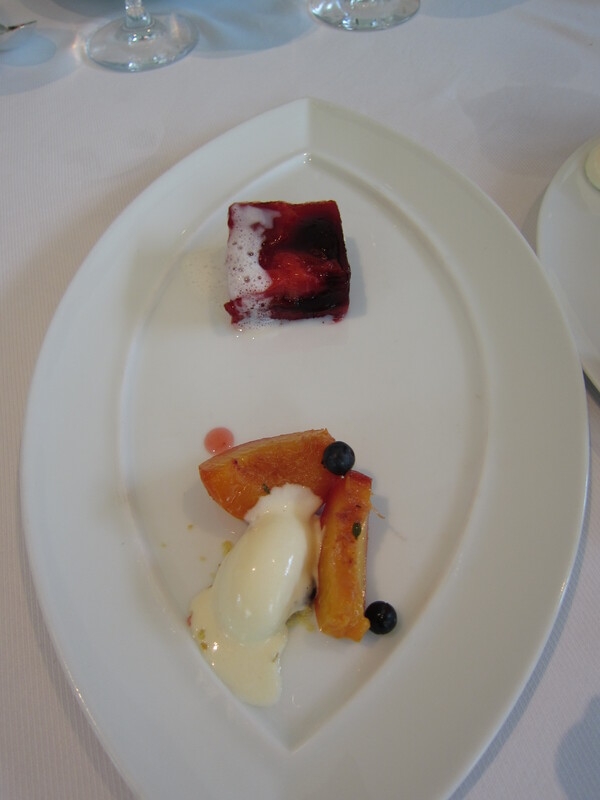 The dish was paired with nice crisp white from Germany. Our second course was exactly what I pictured in my mind as the ideal brunch entree. A lovely fresh poached egg sat on top of some potatoes, romanesco, maitake mushrooms, and summer squash, all with some hollandaise sauce poured over them. To make things better, delicious tender duck confit gave the dish its savory element. Some mustard greens, a drizzle of chive oil, and a slice of crispy bread on the side finished off this picture perfect and tremendously tasty “Beast Hash” dish. A low acidic Beaujolais from France paired nicely with the dish as well. 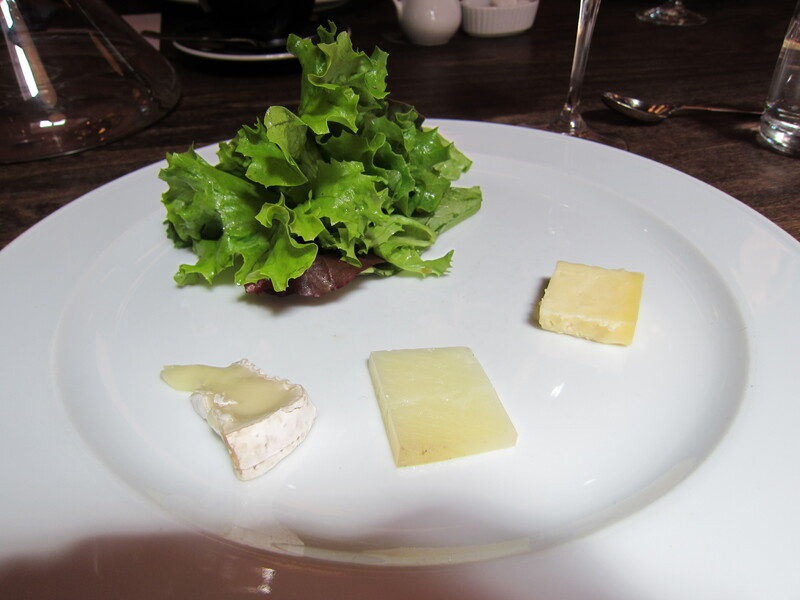 Following the main entree, we had a small plate of cheeses with some fresh farm greens. The cheese were a French sheep cheese, an Italian goat cheese, and a cow’s milk cheese from Washinton state. This dish was paired with a chilled smooth white wine from France that had a hint of sweetness to it. 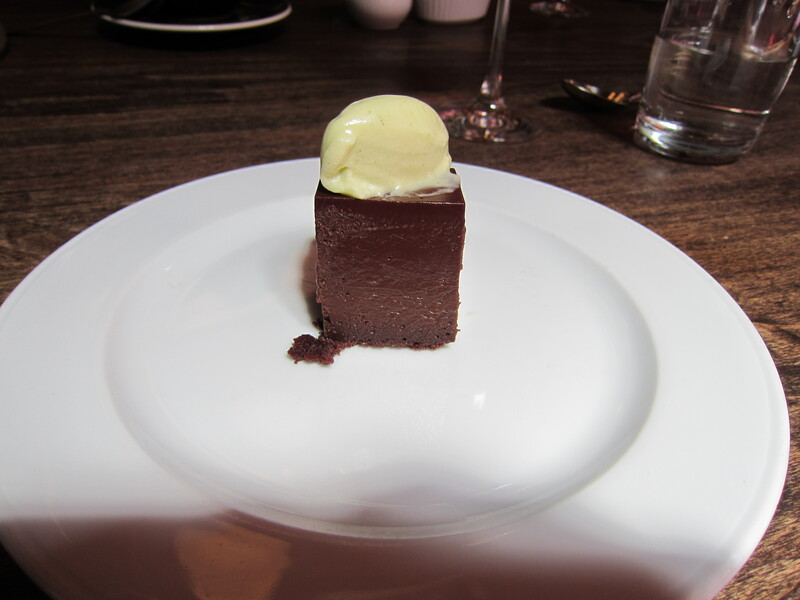 To finish off our meal, we had a chocolate truffle cake. The creamy cake tasted rich and had a very smooth texture, topped with a peach leaf and white chocolate mousse that was not too sweet, so it balanced well with the chocolate cake. 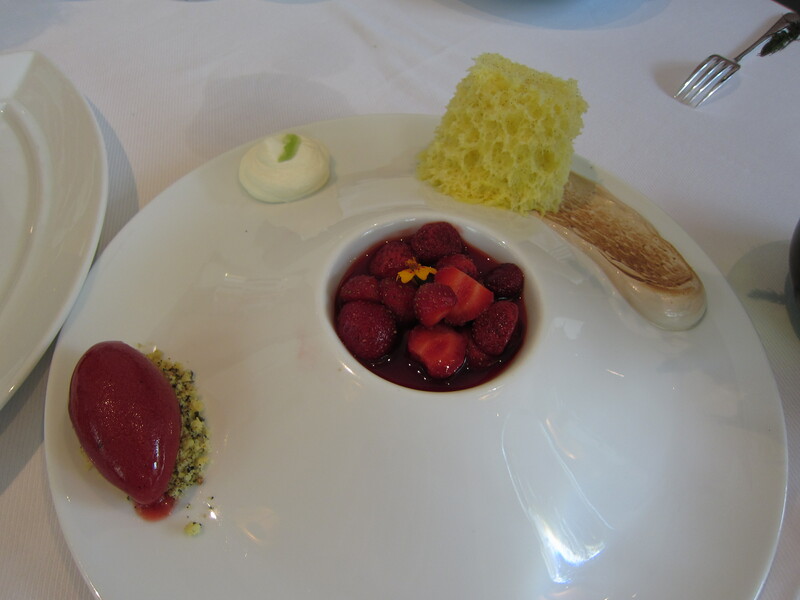 A strawberry rose from France was paired with this dessert. Of all the food I ate in Portland that weekend, the brunch at Beast was my favorite. The food was not only fresh and delicious, but all the wine pairings complimented the food well, and I could really see the thought that went into each dish. Portland should consider itself lucky to have Chef Pomeroy at the helm of such a wonderful restaurant. I cannot wait to go back and treat myself to dinner. Thank you Beast! A Trip to Portland or Thailand? I was really excited to go to Portland and experience the food scene out there because I had heard so much about it. Even though Pok Pok just opened a NYC location, I needed to try the original and see what all the hype was about. We got there around 1pm on a Saturday afternoon and only had to wait about 10 minutes. For such a popular place, this was already a win in my book. Another win was the fish sauce wings, ordered spicy. They were lathered in an almost Korean-style wet sauce with spices and red chili flakes. The meat was tender and juicy in their slightly crispy outer skin. Unfortunately, this was the only real high point for me. The charcoal rotisserie roasted game hen was another one of their specialties and while good, it was not enough to impress. The marinade added a lot of different flavors to the subtly smokey meat. However, the meat could have been juicier; also, whenever there are extra dipping sauces on the side, I feel like it takes away from true taste of the meat and cooking. Good meat and seasoning should be able to stand by themselves. Everything else we tried was just OK too. The grilled boar collar had a citrus-y garnish. And the grilled baby back ribs were small and lacking in meat. They tasted almost exactly like Chinese spare ribs, so there was nothing unique to me about the dish. I would come back to have some more wings and try some other dishes, but my overall reaction for my first time at Pok Pok was just slightly disappointing. Until next time.